Non-enveloped, quasi-spherical, 26 nm in diameter, with a T=1 icosahedral symmetry and bacilliform (37, 43, 48 and 55 nm long and 18 nm wide). 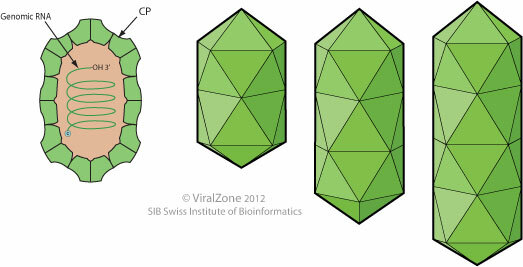 Three genomic and one subgenomic segments are encapsidated in distinct particles, resulting in several different types of virion. Segmented, tripartite linear ssRNA(+) genome composed of RNA1, RNA2, RNA3 kb. Each genomic segment has a 3' tRNA-like structure and a 5’cap.